A whopping 93% of Americans eat pizza every month. To satisfy America’s pizza craving, 75,243 pizzerias across the country baked 45.1 billion dollars worth of pizza last year, per PMQ’s 2018 Pizza Power Report. 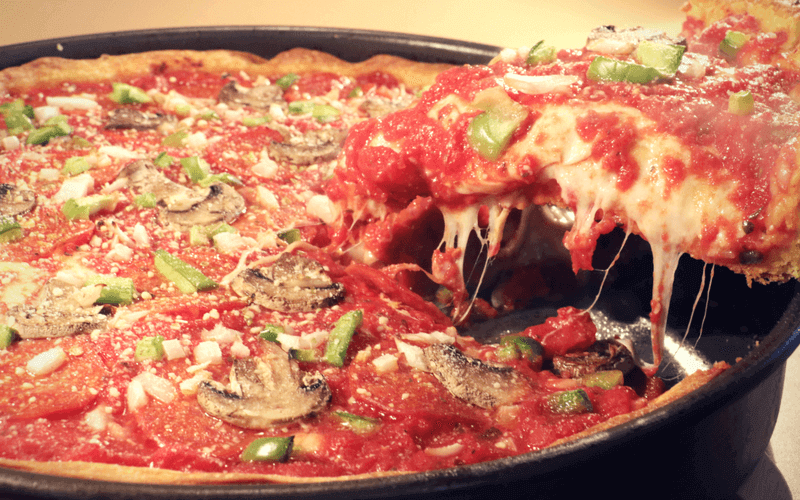 It is safe to say, pizza pretty much sells itself, but here is the challenge – If you are the 2 out of every 3 pizzerias in America that are independently owned, you face growing competition from local businesses and large chains. It is important to get noticed and be on top of customer’s mind when they think of pizza the next time. This is where a well-designed pizza marketing strategy is important for every Italian restaurant or pizza shop. The strategy should include both proven conventional restaurant promotion ideas and newer innovative ways to market your restaurant. An effective strategy can increase pizza sales and revenue growth for the pizzeria. 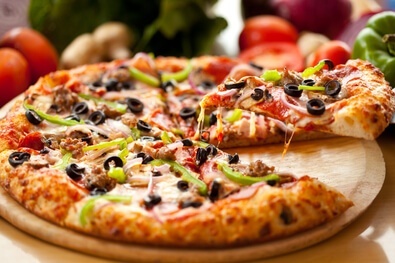 Here are top 15 pizza marketing ideas that you can include in your restaurant marketing plan. Consider a few or more of these ideas at a time to implement. We have high confidence that these ideas can lead to an increase in pizza sales and overall revenue growth for your restaurant. Good quality pictures of your food resonate with customers. Mouth-watering images of pizza with melted cheese and the perfectly baked crust arouses the appetite of potential customers. For success with social media platforms and digital channels, visual media is a must. As Facebook analytics show, posts with images have significantly higher engagement compared to text only posts. On Instagram and Pinterest, good quality images are a must. Hire a good food photographer who knows how to make your food look amazing. Using stock images is not a good idea as people identify the food and are disappointed when the image they see and the food they get from your pizzeria do not match. Which photo do you think evokes a strong desire to have pizza? The first photo (A) does not inspire due to the low quality. The second photo (B) does not relate since it is too perfect and probably nothing close to what the actual food looks like. The third photo (C) is real, it represents the actual food, looks realistic and increases desire. Pro Tip: It is a good investment to get a professional set of photos of your food. Reuse these images on your menu, fliers, promotions, website and social media platforms. Your customers have multiple needs and tastes. 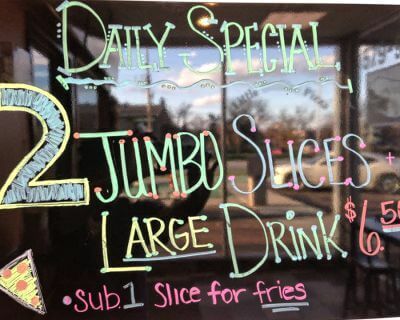 While it’s great to get orders for several pizza and related menu items, offering pizza by the slice is always a good option to have to attract customers who come by themselves. Offering a combo of a slice of pizza and pop in the $4-8 range will attract walk-in customers during lunchtime, especially. Most walk-in business in pizzerias consists of people looking for pizza by the slice; so do not make them buy a whole pizza. This is a great restaurant promotion idea to implement when you are trying to attract the younger crowd who are looking for a bite, and not to carry a whole pizza home. 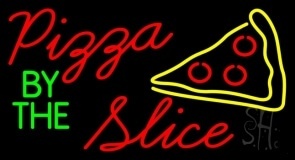 To promote the pizza by the slice deal, have a neon sign in the front window that can be seen from the access road. Consider using pizza sign feather flags by the road curbside as well. Learn more about hyper-local marketing ideas for restaurants. When it comes to getting food for a group, ordering pizza is the easiest option compared to any other kind of food. Because pizza can be shared versus individual orders with Mexican, burgers etc. The person ordering the food has the simplest option with ordering pizza by just selecting a package that is adequate for that group. Create combo package deals for various group sizes in your carry out menu making it really easy for customers to order. 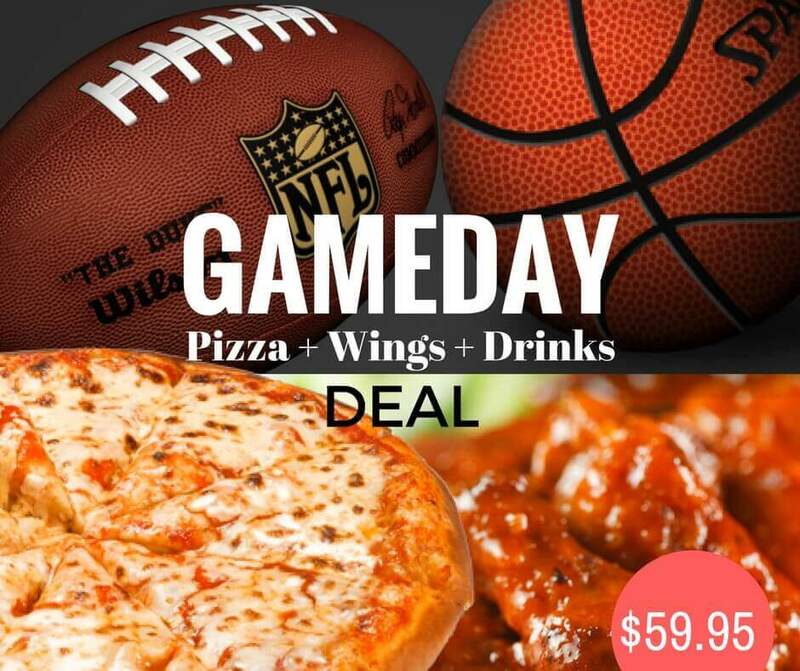 Consider having a combo package deal for game days. Another good combo deal is targeting families of 4-5 for those weekend home movie nights and other family events. Creating multiple combo deals can also be used to promote new items on your menu. But be careful with promotions and deals, because if you do it too much and for too long people will start demanding cheaper prices and that could affect the business bottom line. 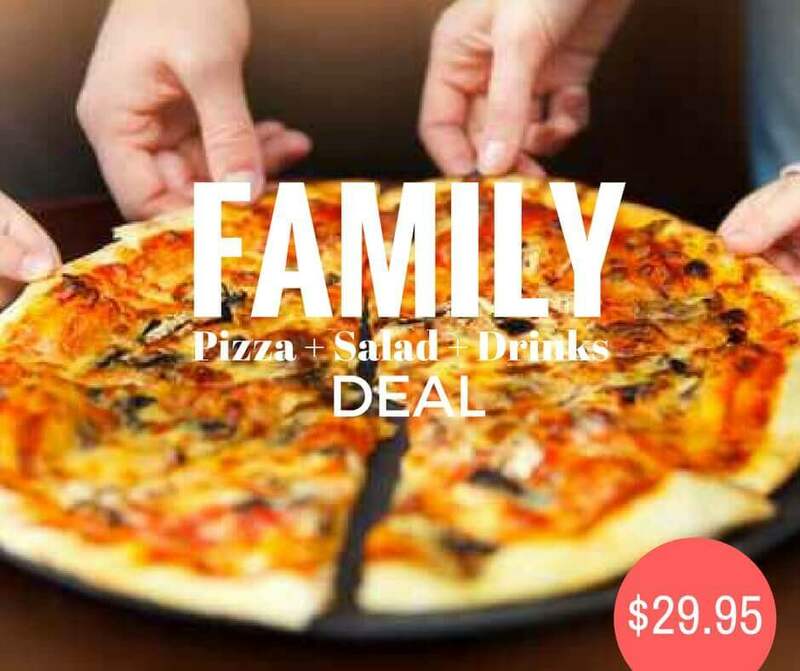 Italian restaurants and pizzerias are probably the most effective in the restaurant industry when it comes to coupons and deals promotions. Coupons from Italian restaurants and pizzerias (and hair salons) have continued to resonate with customers. Coupons have been a proven way to increase foot traffic to your pizzeria. If you place an incentive in a local magazine, newspaper or direct mail campaign it will cause more customers to go to your place of business than a regular advertisement without coupons. When creating coupons deals, they should be for a limited time only. Scarcity sells. But an ongoing stream of offers should always be a part of your marketing plan. Always lay out the terms of the promotion clearly on the coupon, otherwise, some people tend to abuse them. Being found online is the most important thing when trying to attract new customers to your pizzeria. The pizza business is hyper-local. More and more customers search on various local directories and search engines such as Yelp, Google, Facebook and other popular directories and social platforms when they are looking for new pizza places. “Pizza near me” is one of the highly searched terms on Google. You want to ensure that your pizzeria appears online and the basic NAP information (Name, Address Phone number) is correct for your business in the major local directories. we often see new client listings that are incomplete or incorrect. That confuses customers and the search engines, which can lower your online visibility. Pro Tip: Most directories will allow you to upload 10 images and some videos, but most businesses don’t! This represents a huge advantage over your competitors. You can also post videos shot with an iPhone or Smartphone and then edit the videos on the phone. There are also services, like Animoto, that allows you to create videos using photos. These help more people select your listing and get them to order online, by phone or in-house. Use the best images available, including the outside of your store and some mouth-watering pizza pix. If the owner is famous locally, we suggest you include a picture of them as well. The pictures should support the various groups you want to sell to, from a slice of pie to a big catering order. With the Millennial audience, plastic punch cards simply do not work anymore. Create a digital rewards program for your loyal customers that is simple for them to check-in at each visit, earn rewards and redeem rewards. Apart from relieving the need for customers to physically carry the cards, it is cost effective for the business by eliminating expensive plastic printing costs and maintenance. A “custom” loyalty program branded for the restaurant is much better than marketplace loyalty programs such as Belly or Spring. And unlike 3rd-party vendors, you own the program and keep all the proceeds. With your own custom loyalty program, you have full access to customer information that you can re-market easily. Avoid the 3rd party marketplace loyalty programs where you have restricted access to your customer information and often higher marketing costs. Building a customer email list is one of the most effective and inexpensive ways for pizza shops to connect with their customers effectively and re-market to them. The key to engagement and conversion is to nurture the email list using relevant content to ensure high open rates and click-thru rates. One of the issues with many email marketing campaigns is the lack of segmentation. They are often referred to as “email blasts” which results in poor customer engagement. With each segment, you can deliver content and offers that resonate the most for that segment. As an example, dine-in specials should be sent to reservations customers ideally. It may not resonate with online ordering customers; while a free delivery coupon should only be sent to online ordering customers. The key is to send RELEVANT offers to specific target audiences. Learn more about effective email marketing strategies for your restaurant. 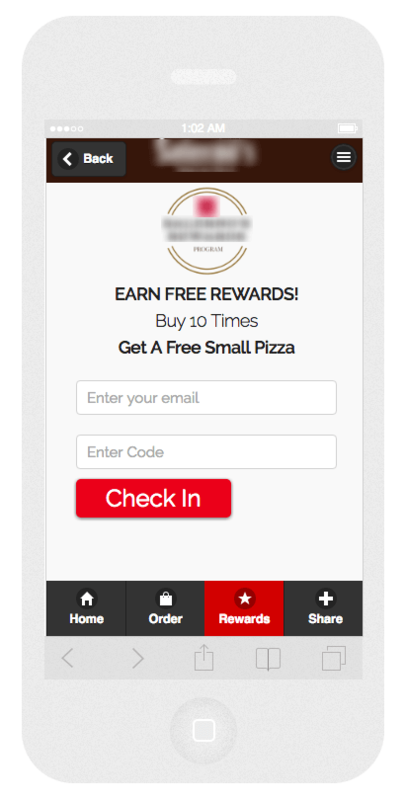 For pizzerias looking to tap into customers by engaging them on their mobile devices, there are quite a few options. Text messages are opened more often than emails, that’s why text messages are a great way to reach your market but you need to be careful not to be too invasive or your efforts will have the opposite effect and put people off. Creating a mobile app for your business provides your loyal customers a convenient way to order and drive up repeat business. We have revised The Digital Restaurant’s mobile app to compete with the chains at an ‘independent’ price. Mobile apps are also a great way to place your brand on the top spot of your customer’s mind when they think of pizza, and even when they don’t think of pizza as they look at their phone and there you are. Push notifications are becoming increasingly relevant and a better alternative to text messaging. 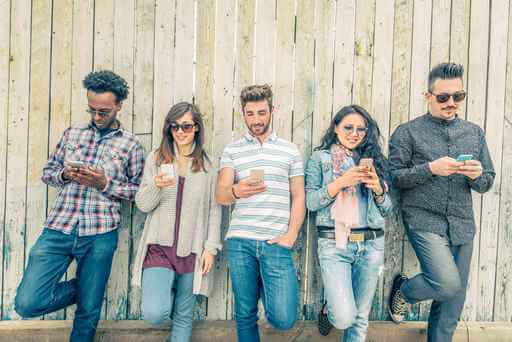 Social media apps such as Facebook, Instagram, Twitter and email apps also provide effective channels where you can drive mobile engagement specifically. The key is to have a mobile engagement “strategy” that includes an ideal mix of the various channels. Multichannel marketing refers to the strategy of interacting with customers via multiple channels, both digital and offline, in order to maximize engagement. Digital channels including social, email and mobile are the most effective and when it comes to customer engagement while being the very cost effective compared to offline channels. Social media platforms such as Facebook, Twitter, Instagram and Pinterest provide a great way to engage with customers and stay on top of mind.Your customers all use different social platforms, so it is important to be on more than one. To stay top-of-mind requires an ongoing conversation on relevant topics in addition to the regular posting of specials and deals that customers see. The key is to create a following on these platforms and ensure you reach people every time you post something. Pro Tip: Social media success depends on being a valued member of the community and follow the 80/20 rule. 80% of your posts should be helpful to the community and not really about you. If Little League tryouts are announced or if the mayor makes a proclamation, you should share or re-Tweet it. Support community events by promoting them. Engage local people with large followings. The more their followers see them engage with you, the more free publicity you receive. Promote specials and new items the other 20% of the time. 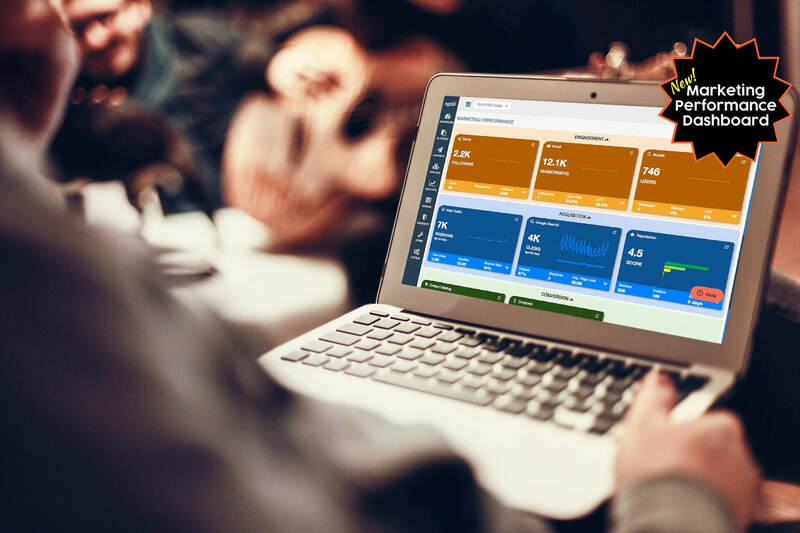 The challenge is having a consistent multichannel marketing strategy requires a commitment to resources and an integrated marketing plan across all the marketing channels. 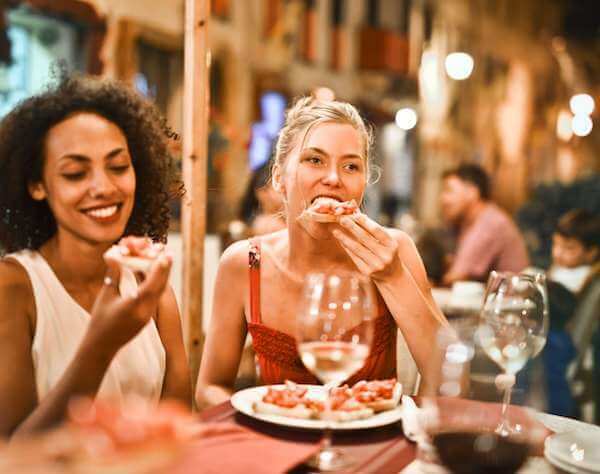 Word of mouth marketing is very effective, and increasing your perception of being a community leader gives people a reminder or reason to recommend your pizza to friends, family, and others in the community. Look for opportunities to sponsor or participate in fundraising programs at your local school, church, service organizations and sports teams. Many have “Dine and Donate” fundraiser programs, where a certain % of the dinner check is a contribution to the fundraiser program. These are great opportunities to get visibility and creating buzz. Donate pizza at such events for free for people to sample your food. For your pizza marketing strategy to be successful, operations has to tightly sync with marketing. You need to ensure the order-taking and order fulfillment processes are working to meet or exceed customer expectations. For carryout and delivery, ensure phone ordering, online ordering and mobile ordering (if offered) are working well to ensure the order accuracy. As your business grows, your kitchen staff and front desk need to have great communication and have systems in place to deal with multiple orders. 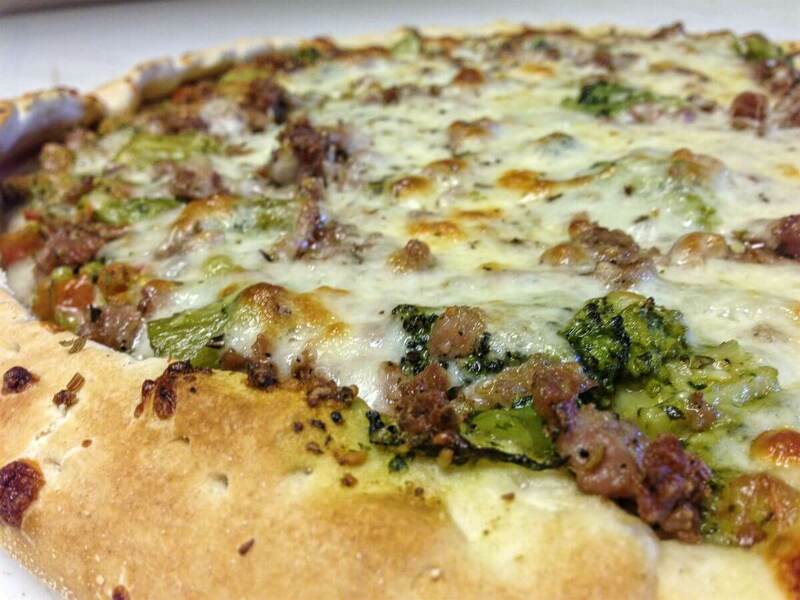 Your kitchen has to be able to pump out orders quickly maintaining deliveries of consistently delicious hot pizza. Your POS system needs to be working and able to handle peak volumes of Fridays and Saturdays. You have to be able to take credit cards, especially with online orders. Your delivery staff needs to be on call. Without this marketing will do your pizzeria no good. People are creatures of habit when it comes to ordering pizza. If customers love the pizza and like the customer service, they generally become repeat customers. And they tend to refer their friends! Pizzerias tend to get a loyal customer base once a preference has been established. Most people will find their favorite and stick with that one for a long time. If you can deliver good quality food consistently and provide decent customer service, you will have a loyal customer base for a very long time. The key is to get to your customers with a solid pizza marketing strategy and then just stay consistent and deliver quality pizza every time. To attract new business, your reputation is the 2nd most important thing. The first is being found online on local directories (#7). With mobile users, checking the reviews and ratings on businesses is an instant click away. The pizza business is very local. It is dependent on a lot of word of mouth advertising. Remember that people are 2 times more likely to tell others when there was a problem than they are to tell people how great your place is. What is even more amazing is people are 7 times more likely to tell others when they had a problem and was subsequently handled to their satisfaction than they are to tell others about a good experience with no problems. It pays to handle customer issues. Monitor online review sites, find out what people are saying and respond to their feedback promptly. If you made a mistake with an order, offer an honest apology, offer a refund and invite them to try you again. Sometimes it is necessary to build your online reputation. 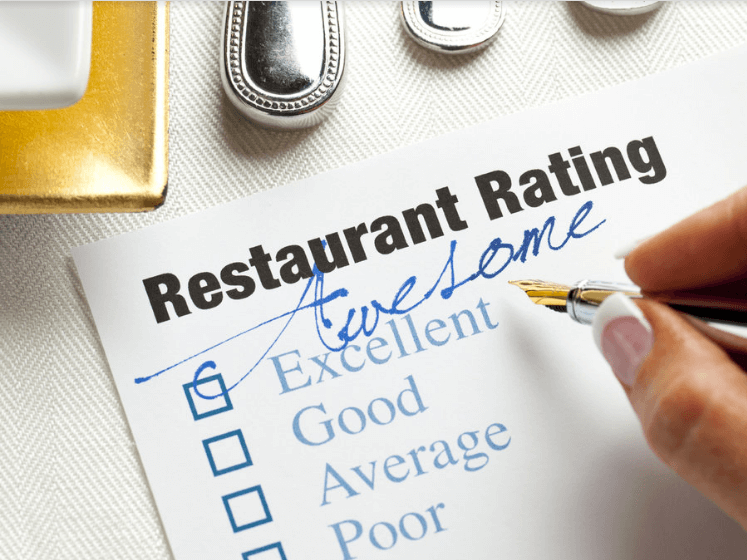 It is not necessary to have a perfect 5-star reputation, but it is important to have a rating over 4.0. Work at a Pizza Place is an entertaining Roblox game for ages 6 and up. The plot of the game is working at Builder Brother’s Pizza and experience different occupations to earn money for customization of your house. The players work with different jobs in Work at a Pizza Place. Pizzerias can create promotions to attract players of Work at a Pizza Place game. Some promotion ideas include creating a special deal for game winners. Another idea is to have a Roblex playset in a waiting game area. Any game related instore and social media promotion ideas will help drive engagement with children who love pizza. Social media platforms such as Facebook, Instagram, Twitter and Search Ad platforms such as Google Adwords, Bing Ads and Waze Ads provide a quick way to buy traffic to your website and to your restaurant. The key to successful pizza ads is knowing your target market well, creating enticing offers and running effective pizza advertising campaigns. 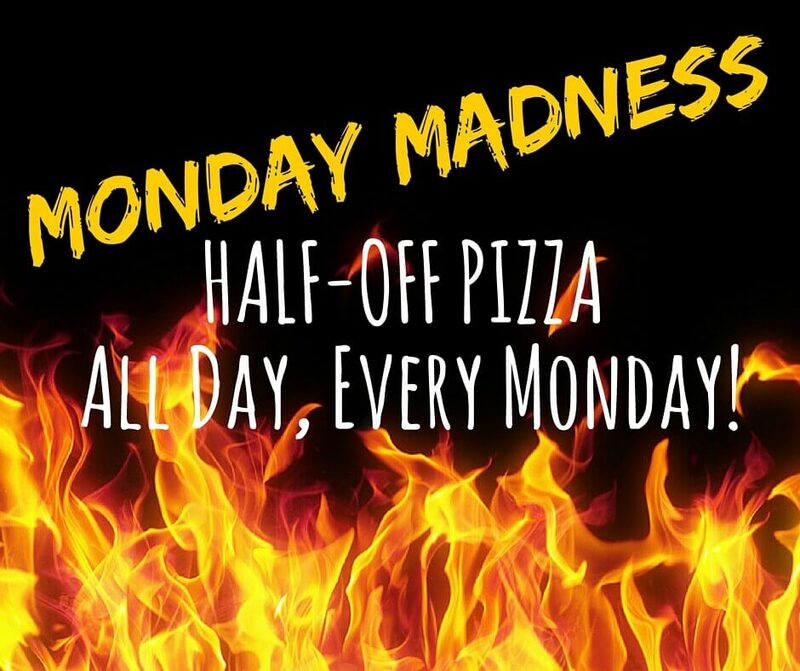 Some of the popular days for pizza are game days, Halloween, Thanksgiving eve, New Years Eve. Paid advertising provide a quick and effective way to attract new customers to your business. It is traffic-on-demand. Pizza marketing is all about being number one in your customer’s mind, in addition to good food and service. 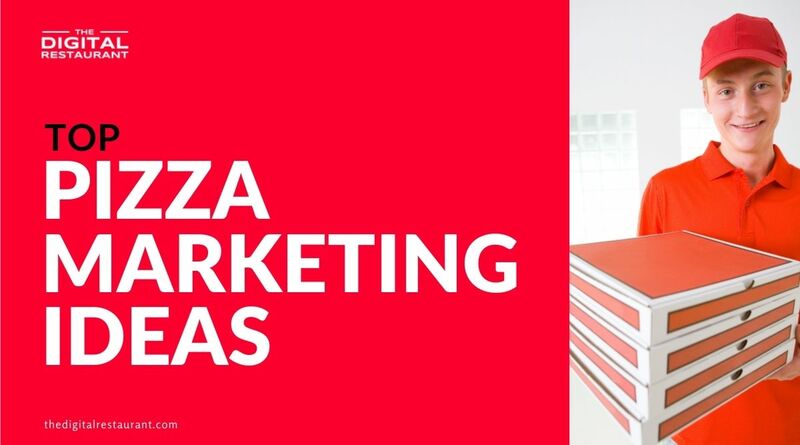 If you can accomplish that by using marketing ideas that put you on top of mind, you have got the upper hand because the pizza business is one of repeat business. Be number one in the customer’s minds and you will always succeed. 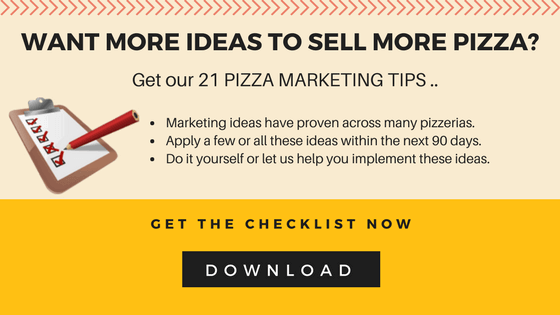 Go and put these pizza marketing ideas into practice! If you found this article helpful, please leave us a comment. We would love to hear what you have to say.